At the 2018 Detroit Auto Show, , an all-new truck from the ground up that went on a 450-pound diet and gained some diesel torque. Like the new , the bowtied pickup adds a slew of new features to satiate the needs of truck lovers, and it now sports what Chevrolet claims is the most functional bed in its class. “With the all-new Silverado, we've taken the best truck on the road and made it even better,” said Mark Reuss, General Motors executive vice president of Global Product Development. Beneath the Silverado is a reworked, fully boxed frame that weighs 88-pounds less than before thanks to copious use of high-strength steel, even though it provides for a 3.9-inch longer wheelbase and is 1.6-inches longer overall. The frame's structural rigidity is also improved by 10 percent. Bolted to that frame is a redesigned suspension and new live-rear axle, which come together on new composite springs that also weigh 12-pounds lighter than before on each side. Wrapped around the Silverado's frame is a new, lighter, more aggressive body with a refined front end design and enough differentiation between trims to give nearly all truck buyers the exact look they want. Aluminum makes an appearance on the Silverado, though it's not as omnipresent as it is on the F-150. Instead, Chevrolet has chosen to use the material for swing panels, such as the doors, hood, and tailgate, while all the fixed panels are still composed of steel. The result is a further 88 pounds of weight savings. Under the new, lighter hood, Chevrolet has confirmed three engines so far. The first two are continuations from the previous-generation truck—5.3- and 6.2-liter V-8s. For 2019, however, the V8 engines have been fitted with Dynamic Fuel Management, which allows them to run on just one cylinder in certain conditions to save gas. The third engine is a brand-new 3.0-liter inline-6 turbodiesel engine. The Silverado and Sierra are the first vehicles to get the new diesel and Chevrolet has yet to announce output and fuel economy details for it. Expect those details closer to the truck's launch. Those looking for a less expensive option will be happy to know there is still likely a smaller engine to be announced later that will replace the 4.3-liter V6 from before. A new 10-speed automatic transmission will be fitted to the diesel and larger V8 engines. Inside, the Silverado is roomier than before, too, thanks to its longer wheelbase. Chevrolet claims seats are more comfortable and its in-cabin storage more usable. Meanwhile, the Silverado brings Apple CarPlay, Android Auto, wireless phone charging, and 4G LTE WiFi connectivity so you can fully enjoy the time spent in the redesigned cabs. 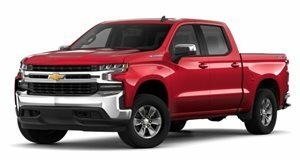 At the back, Chevrolet says the Silverado sports the greatest cargo capacity of any pickup truck thanks to a new, multifunction bed that's now up to 7-inches wider. It will also swallow up full 4x8 sheets of plywood flat on the foot, between the wheel wells. You won't need to worry about the bed floor getting gnarly as Chevrolet made the base stronger and more durable, and you'll be able to haul damn near anything with 12 fixed tie-downs. Loading is made easy with a power up/down tailgate and CornerStep bumpers. For 2019, Silverado will be available in trims grouped by buyer profile—High Value, High Volume, and High Feature. High Value includes the basic Work Truck trim, which features 17-inch steel wheels outside and vinyl/cloth seats inside. The Custom and Custom Trailboss trims round out the value group. Both come with LED taillights and dual exhausts, but the new Trailboss model also adds some off-road kit like a suspension lift, off-road shocks, a locking rear diff, and skid plates. Custom models wear 20-inch wheels while the Trailboss model ditches them for 18-inch wheels with off-road tires from Goodyear. High Volume models are what you expect: they're the trucks most buyers choose. That group includes the ever-popular LT and two new trims for 2019: a street-appearance RST (adopted from the Tahoe), and the LT Trailboss, which gets the same off-road options as the Custom Trailboss. Those willing to spend a bit more coin on a fancier truck can opt for one of the High Feature models: the LTZ or High Country. Both of those trims bring with them leather interiors and other luxury-level items. The new 2019 Silverado will be built in Fort Wayne, Indiana, and go on sale this fall. Pricing will be announced closer to launch. Нашел в интернете полезный веб портал про направление https://rs-clinic.com.ua.